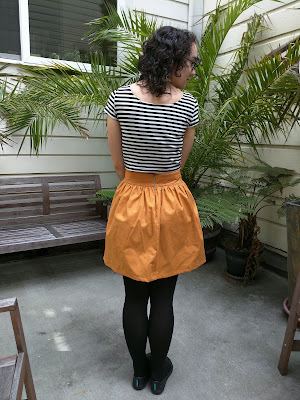 This was my 4th big project from Love at First Stitch, the Clemence skirt. 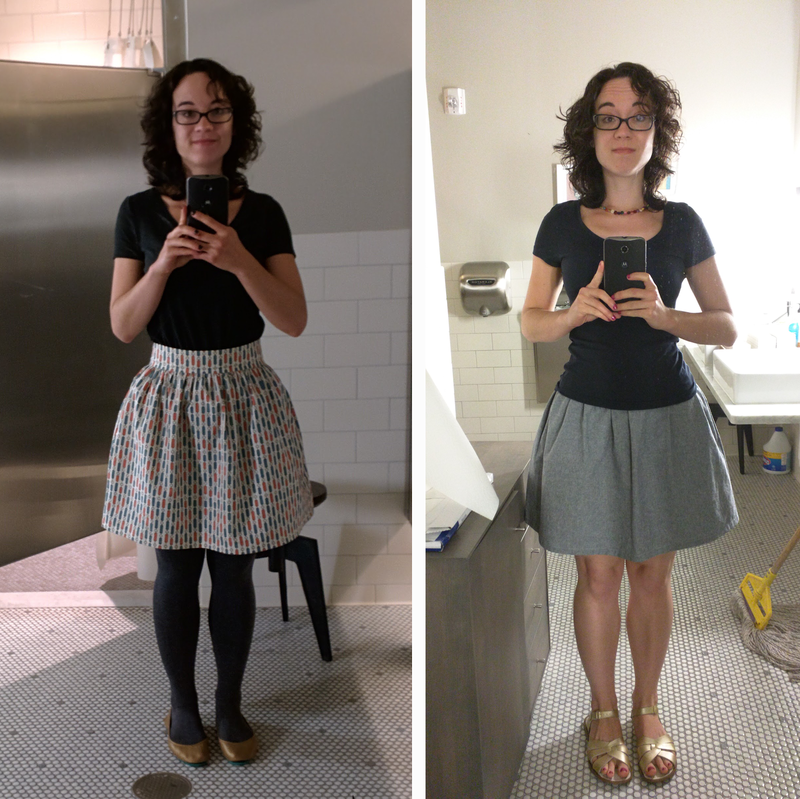 This skirt was really exciting because it was almost exactly like a black skirt I bought a few years ago and ModCloth and love - it's so simple and comfy and flattering and perfect with t-shirts. So I made one, and then two more! before moving on in my book. 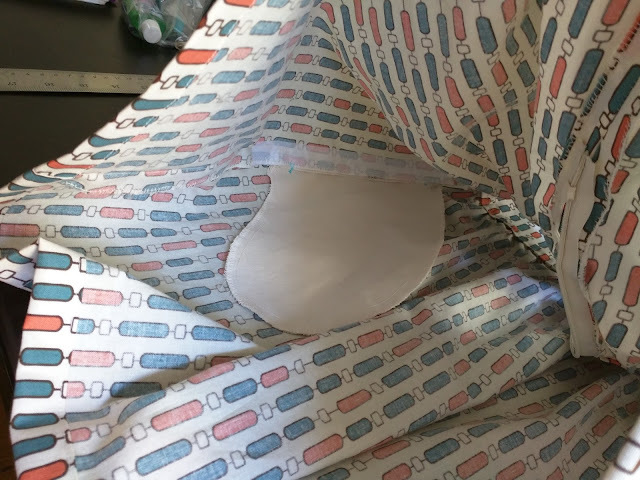 My versions are a bit poofier than the ModCloth one, even though I tried to use the same circumference of fabric. I think this is because my cotton is pretty sturdy so it holds the gathers better. I mostly don't mind but occasionally feel a bit silly in them (only a bit though). 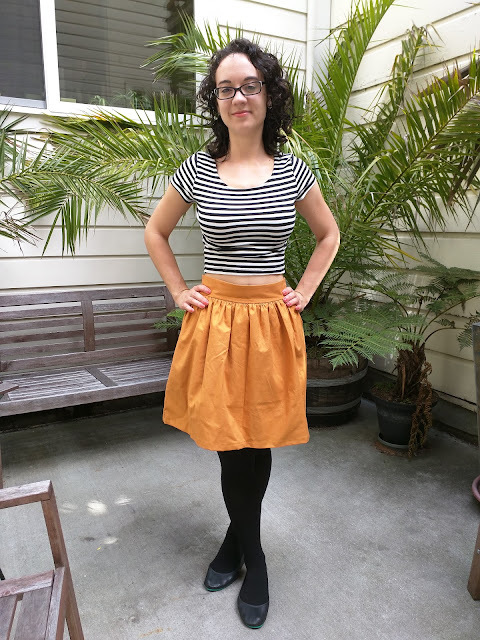 This skirt was interesting because it didn't come with a pattern to trace and cut, just instructions to make my own using my waist measurement. I have found that I like less ease in the waist (ie. I like things tighter than pattern makers expect me to), so I used my existing skirt to determine the waist circumference, and it worked out perfectly. I like the simplicity in this one. After I got the hang of it, they are super easy to throw together even with pockets. My first attempt at the Clemence was out of a gold cotton fabric and I made it exactly as outlined in the book, aside from measurement adjustments. 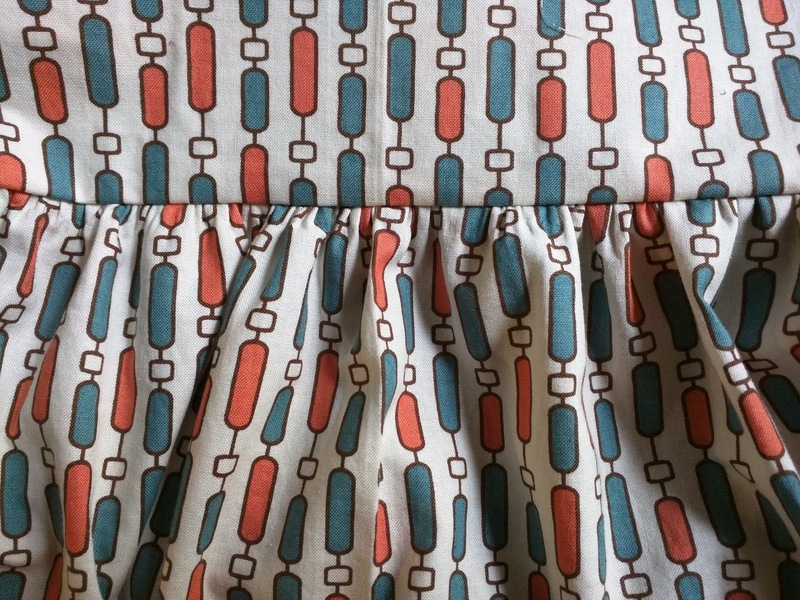 This meant french seams (no raw edges showing!) and no pockets. My only WIP pic of this one - this is how you do gathers! Lots of loose stitches, pull on the threads until it bunches up to the right size, then sew for real and remove all the basting stitches. 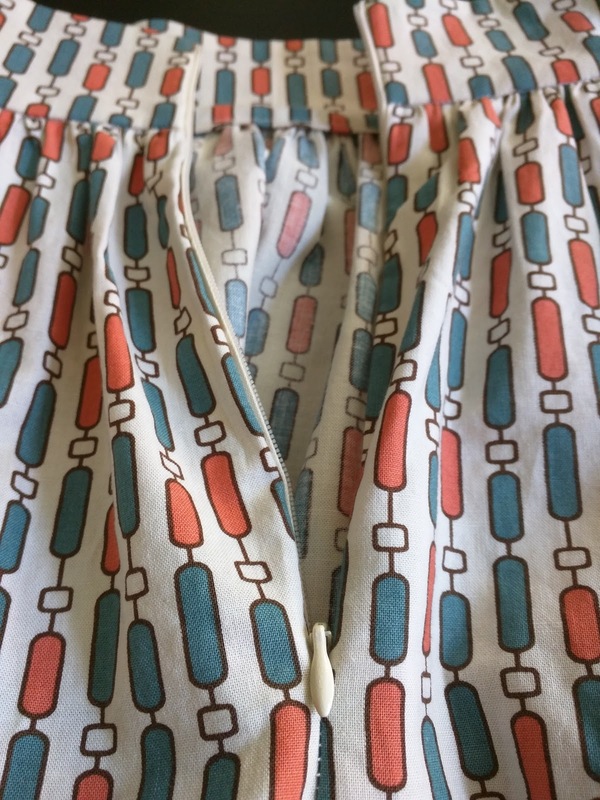 I did contrasting invisible zippers on two of these and I like them - I kind of wish they were more visible though! The chambray skirt (seen in a photo at the bottom) has a teal one, which I love the color of but it is almost too invisible. Oops. French seams. 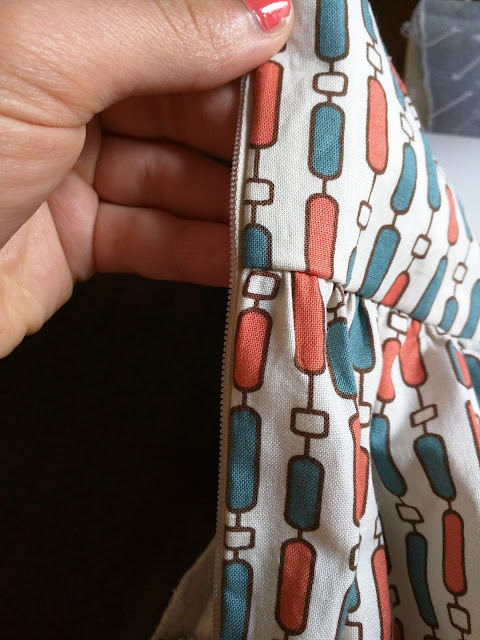 You sew the ends together in one way, then flip it and sew it the other way to enclose the raw edges. So neat and tidy! The others don't have this because I'm not sure if there is a way to do these with seamline pockets. Pockets! My book also outlined how to add these (as an optional step, so I skipped it in my first try). They are super hidden in the full skirt, and I made them big enough to hold my giant phone. Score! Stuff I learned by making the Clemence skirt: simple pattern drafting; making and inserting side-seam pockets (this is really useful!! ); how to sew French seams; and I guess, the joy of making a good pattern over and over! I swear I'm going to try to get better photos of me wearing things going forward. But for now I'd rather get through a bit of my massive backlog of projects than wait even longer until I take all the photos.